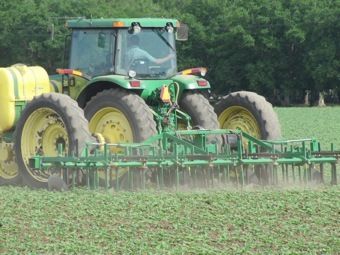 Reducing tillage is one technigue farmers are trying out to cut carbon emissions. Reducing tillage is one technique farmers are trying out to cut carbon emissions. Supporters of sustainable agriculture are looking forward to some “sustenance” of their own, after an eleventh-hour win in Sacramento. Just as the state’s last legislative session was drawing to a close, Assembly Bill 1532 passed by a vote of 51-28, sending to the governor’s desk a system for allocating cap-and-trade auction revenues, which are expected to reach into the billions of dollars by the end of next year. AB 1532, authored by Assembly Speaker John Pérez, lays out an approach for ensuring that all proceeds from the sale of permits be used to further reduce greenhouse gas emissions. Among the eligible activities identified in the bill are farming and ranching practices that reduce greenhouse gas emissions and sequester carbon, such as reducing soil tillage, improving energy and water efficiency, and reducing synthetic fertilizer use through compost, cover crops, and crop rotation. “A lot of these practices also have a number of co-benefits such as reducing air and water quality, reducing erosion, and improving soil quality,” said Renata Brillinger, executive director of the California Climate & Agriculture Network (CalCAN), which lobbied to have sustainable agriculture included in the bill. In addition to promoting specific farm practices, AB 32 auction revenues could also go toward researching and developing new approaches, providing technical assistance to farmers, offering financial incentives to help them transition to climate-friendly methods, and helping to shield California’s farmland from urban development. A study released in July by the California Energy Commission and the California Natural Resources Agency and performed by researchers at UC Davis found that urban land accounts for 70 times more greenhouse gas emissions per square acre than cropland. CalCAN has been angling to secure sustainable farming’s piece of the AB 32 pie since 2010, when Senator Lois Wolk (D-Davis) introduced a bill that offered guidelines for spending cap-and-trade revenues on agriculture. The bill got held over in committee, and CalCAN and Wolk tried again in 2011 — with the same result. The legislature preferred to take a more comprehensive approach toward appropriating cap-and-trade revenues, said Brillinger, and that’s just what happened with AB 1532. Now Brillinger and her colleagues — along with their partners at Community Alliance with Family Farmers, Ecological Farming Association, and California Certified Organic Farmers — hope that Governor Jerry Brown will take the next step and sign it into law. If he does, the law will go back to the legislature next year for further tinkering, then be passed along to the state Air Resources Board for implementation. Only then will we get any sense of just how much money could go to sustainable agriculture, or even begin to calculate the sort of greenhouse gas emissions that could be achieved statewide. “Everyone wants to have those hard numbers, but it’s proving elusive,” Brillinger said.” For now, the basics will have to do. Look for in-depth reporting on how climate change is affecting California’s farm economy in the upcoming multimedia series, Heat and Harvest, a joint project of KQED and the Center for Investigative Reporting.